(Nanowerk News) The gentle touch of a lesion on the tongue or cheek with a brush can help detect oral cancer with success rates comparable to more invasive techniques, according to preliminary studies by researchers at Rice University, the University of Texas Health Science Centers at Houston and San Antonio and the University of Texas M.D. Anderson Cancer Center. The test that uses Rice's diagnostic nano-bio-chip was found to be 97 percent "sensitive" and 93 percent specific in detecting which patients had malignant or premalignant lesions, results that compared well with traditional tests. The study appeared online in the journal Cancer Prevention Research ("Nano-Bio-Chip Sensor Platform for Examination of Oral Exfoliative Cytology"). 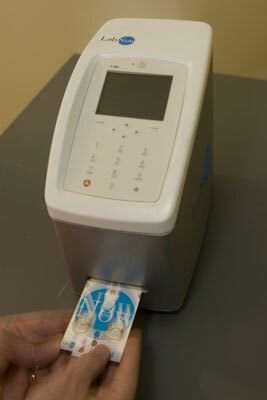 LabNow device to read nano-bio-chips that will look for signs of oral cancer and other diseases. "One of the key discoveries in this paper is to show that the miniaturized, noninvasive approach produces about the same result as the pathologists do," said John McDevitt, the Brown-Wiess Professor of Chemistry and Bioengineering at Rice. His lab developed the novel nano-bio-chip technology at the university's BioScience Research Collaborative. Oral cancer afflicts more than 300,000 people a year, including 35,000 in the United States alone. The five-year survival rate is 60 percent, but if cancer is detected early, that rate rises to 90 percent. McDevitt and his team are working to create an inexpensive chip that can differentiate premalignancies from the 95 percent of lesions that will not become cancerous. The minimally invasive technique would deliver results in 15 minutes instead of several days, as lab-based diagnostics do now; and instead of an invasive, painful biopsy, this new procedure requires just a light brush of the lesion on the cheek or tongue with an instrument that looks like a toothbrush. "This area of diagnostics and testing has been terribly challenging for the scientific and clinical community," said McDevitt, who came to Rice from the University of Texas at Austin in 2009. "Part of the problem is that there are no good tools currently available that work in a reliable way." He said patients with suspicious lesions, usually discovered by dentists or oral surgeons, end up getting scalpel or punch biopsies as often as every six months. "People trained in this area don't have any trouble finding lesions," McDevitt said. "The issue is the next step -- taking a chunk of someone's cheek. The heart of this paper is developing a more humane and less painful way to do that diagnosis, and our technique has shown remarkable success in early trials." The way forward is with nano-bio-chips -- small, semiconductor-based devices that combine the ability to capture, stain and analyze biomarkers for a variety of health woes that also include cardiac disease, HIV and trauma injuries. Researchers hope the eventual deployment of nano-bio-chips will dramatically cut the cost of medical diagnostics and contribute significantly to the task of bringing quality health care to the world. The new study compared results of traditional diagnostic tests with those obtained with nano-bio-chips on a small sample of 52 participants, all of whom had visible oral lesions, leukoplakia or erythroplakia and had been referred to specialists for surgical biopsies or removal of the lesions. Of those patients, 11 were diagnosed as healthy. The chips should also be able to see when an abnormality turns precancerous. "You want to catch it early on, as it's transforming from pre-cancer to the earliest stages of cancer, and get it in stage one. Then the five-year survival rate is very high," he said. "Currently, most of the time, it's captured in stage three, when the survivability is very low." The device is on the verge of entering a more extensive trial that will involve 500 patients in Houston, San Antonio and England. That could lead to an application for FDA approval in two to four years. Eventually, McDevitt said, dentists may be the first line of defense against oral cancers, with the ability to catch early signs of the disease right there in the chair.